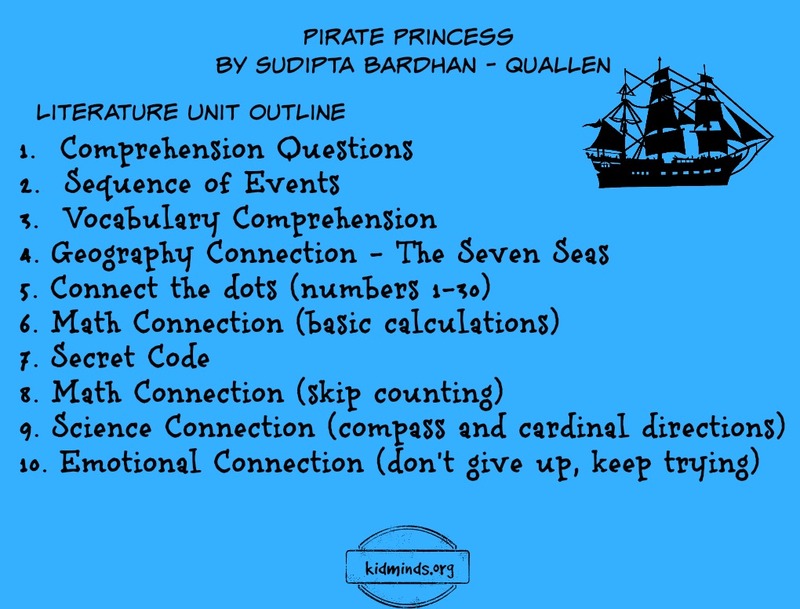 Pirate Princess by Sudipta Bardhan-Quallen is a fun, rhyming book about a brave princess who didn’t want tea parties and fancy dresses, but wanted a life of adventure. When she did end up on a pirate ship her first job was to wash the decks. It wasn’t her dream pirate job, but she did it anyway. Her second and third pirate jobs were not exciting either. But by the end of the book Bea is the mastermind of the whole pirate operation. Her talent is strategy and she has a nose for finding gold. 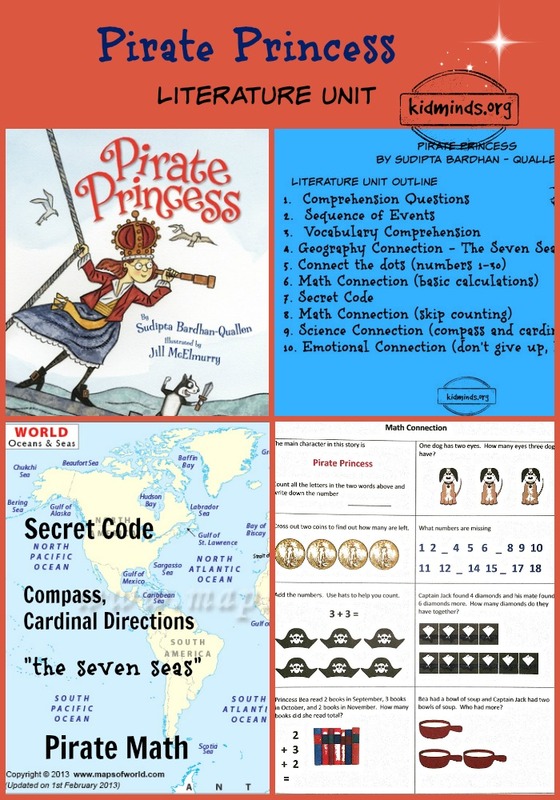 I create our literature units to bring excitement and fun to learning math, to enrich our reading experience, and to have something fun to do with our books. Even though the kids are learning a lot it doesn’t feel like “school.” Each of my literature units may contain some of the following: math problems, comprehension questions, art projects, vocabulary building exercises, trivia about things mentioned in the book, connect the dots, mystery pictures, story related activities, field trips suggestions and more. I developed this unit based on my kids ages (4 and 7) and their learning needs. For example, currently my 4-year old has difficulties with number 13, so the math calculations included in this unit often involve number 13. You can adapt it to your kids, as you see fit. Due to the nature of some charts and graphs they couldn’t be fit into the body of the message here but they available as part of the printables. Click right here for Free Printable. 1. What is Princess Bea dreaming about at the start of the story? 2. How did she get on a pirate ship? 3. Did Captain Jack let Princess Bea stay on board of a pirate ship or he asked her to leave? 5. What can you tell us about Princess Bea’s cooking? Is she good at it? 6. What happened when Princess Bea was ordered to “keep watch on the sea” in the crow’s nest? Was that a good job for her? 7. Why did Captain Jack tell Princess Bea to walk the plunk? 9. How did they find the treasure island? 10. What did pirates do on the island? 11. What did they find? Instruction: print, cut the cards and arrange in the right order. You can laminate the page for durability, if you plan on re-using it. Have you heard the expression “the seven seas” before? What do you think it means? 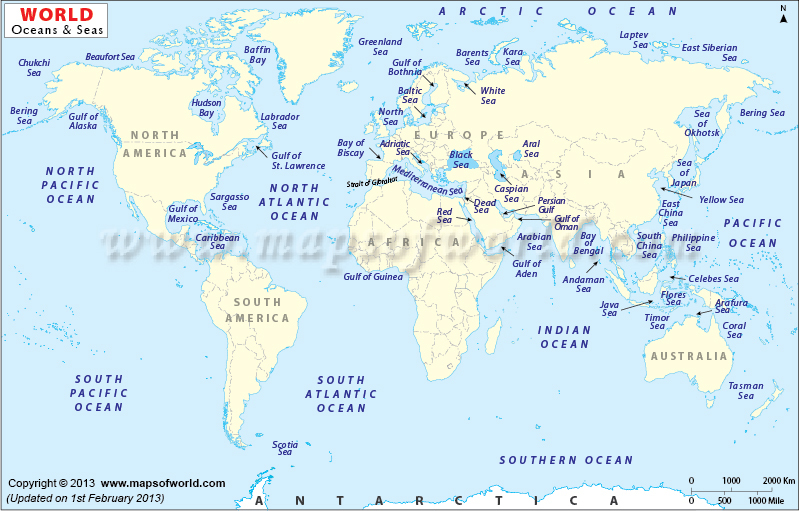 Today most geographers accept the following division of oceans of the world into seven bodies of water: North Atlantic, South Atlantic, North Pacific, South Pacific, Indian, Antarctic (Southern), and Arctic. However, oceans are more commonly divided geographically into the Atlantic, Pacific, Indian, Arctic, and Antarctic (Southern) Oceans. Connect the dots and color the picture. Don’t forget to draw skull and bones on the flag. 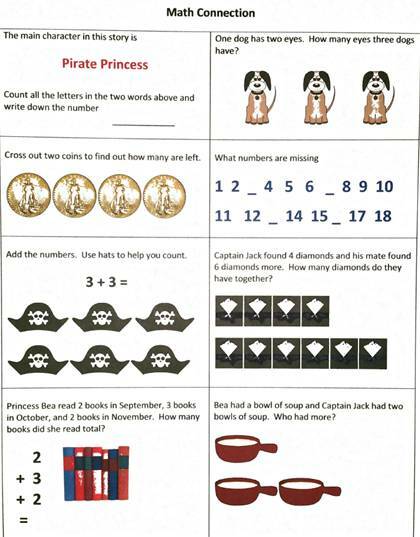 Source: I turned my drawing of a pirate ship into a connect-a-dot to practice numbers 1-30. To draw a boat I used instructions from Dover Publications book How to draw planes, trains and boats by Barbara Soloff Levy.Here is how the final product will look. The actual connect-the-dot is part of the printables pack. My kids love secret messages and special codes. Every day I put something together for them and of course, they asked for a new one based on the book. 1. Use the code to discover what Princess Bea and pirates found on the island. 2. Use the code to uncover Pirates’ password, a secret word they use to know they met a friend. How did pirates of old know where they were and where they were going in the vast emptiness of the open ocean? Stars could be used on a clear night, but the greatest advance in navigation came with compass. The first record of compass comes from 1187. Compass is an instrument that always points in the direction of magnetic north. 1. A magnet is what makes a compass point north. 2. The Earth is a magnet. 3. The earth’s core creates a magnetic field. 4. A compass points toward the top of Earth’s magnetic field. Step 1: Start with teaching cardinal directions. What are cardinal directions? Have you ever heard the word “cardinal”? Cardinal means important, fundamental. There are four main or “cardinal” directions of the compass – north, south, east and west. If it’s not easy for your child to remember these four words, suggest the use of mnemonic device that helps to remember the cardinal points in clockwise order. My kids like Never Eat Stinky Warts (North East South West). Step 2: Talk about why reading compass is important at the age of GPS. Compass cultivates abstract reasoning and ability to visualize when problem solving. Also, you never know when you might find yourself in the woods or on boat drifting across the ocean with all your fancy electrical devices out of power. 1. Let kids practice outside by giving them directions to find north, south, east, and west and by having them determine landmark directions. 2. Print map of your neighborhood, map out a walking tour, and follow it with a compass. Looking for treasure is fun, but Princess Bea needs your help. Use directions to find a treasure. Each square is one mile long. Map the neighborhood with your preschooler here, print 2nd grader worksheets here, and have fun with those worksheets. What‘s the underlying theme of the book? “Underlying” means basic, important. What do you think this book is about? Very interesting answer! Adventure is definitely a big part of this book! How about Don’t give up, keep trying? At first Bea was a deck scrubber and she wasn’t good at that. Her second job was cooking and was she good at it? No! Still Bea was certain that pirate life was for her. Her third job was to look out and how did she fare with that job? She became sea sick all over the captain. But did she finally discover a job that was a perfect match for her? Yes, she did! She didn’t give up! She kept trying and trying! Do you want to talk about what can help you keep trying, even when you feel discouraged by setbacks? right? It’s normal! It happens to everyone at some point. The first thing you need to do is take a deep breath! Try it now with me! Breathe in, breathe out. It’s not easy to remember to breathe when you are mad, but the more you practice, the easier it will become. After a few deep breaths, it’s a good time to ask yourself, “What went wrong?” Is it because the larger pieces were on top of smaller pieces? Are you tired? Try to learn from mistakes. Plan a new approach: you know how to make it not work, now let’s try something else and see if it will make a difference. Maybe not! But it’s fun to try. Everyone has a different talent. Princess Bea was not good at cooking and maybe with a bit of practice she could learn to cook wonderful meals for the entire crew. Maybe not! There are things we will never be good at. It’s fine. Everybody has a special talent. better. When you laugh, your brain receives a message that everything is ok. You can talk more about laughter with this article from How Things Work. children model your behavior. Be a positive role model. Forgive yourself and move on. 3. You can talk more about self-motivation with this site and this book. 1. Make a list of main events of the story and construct a story map. 2. Put yourself in the shoes of Princess Bea and tell us what she feels at different points in the story. 3. Dramatic Play: act out a favorite scene from the book. Now switch places and pretend to be a different character. 4. Find some Pirate Party Foods inspiration with this post from Betty Crocker. 5. Enjoy imaginative play with this set of pirate toys. I hope you will enjoy this book as much as we did!